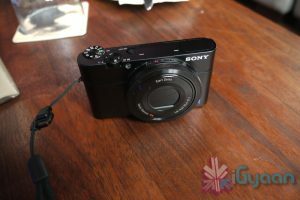 Sony today in India launched their new premium point and shoot camera the DSC RX100, it is being touted as the first Cyber-shot™ with 1.0-type 20.2 effective megapixel sensor and bright F1.8 lens. Initial hands on with the camera reveals excellent low light performance with detailed background and foreground defocus. 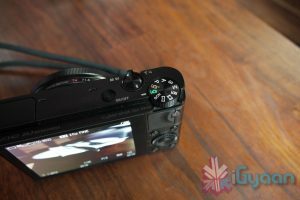 The camera features a 1.0 type sensor which is four times larger than a traditional point and shoot sensor hence increasing the overall light captured in each pixel. The F1.8 lens adds to the low noise performance allowing a wider field of light to pass through. The front adjustment ring is buttery smooth and features multiple selections in different modes. 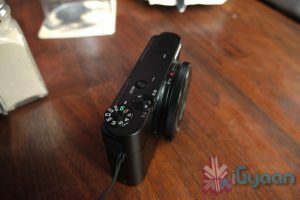 The camera also does full HD video and has progressive modes. The camera also has in body six axis Images stabilisation which works really well at first test. The camera is available today for a price of Rs. 34,999. which may seem a little pricier, but for the high end features this camera gives in a pocketable and premium form factor. Price may not be a factor for the people Sony is targeting with this particular model. Hands on Video below, and expect a full Review iGyaan Style. 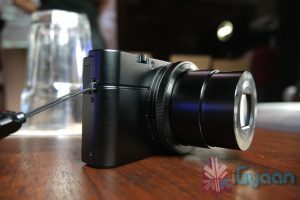 New Delhi, 23rdAugust, 2012: Sleekly crafted in aluminium for strength, lightness and luxurious looks, DSC-RX100 inherits many advanced imaging features from Sony’s ? range of A-mount and E-mount camera families. It’s an accomplished partner for travel, portraits or street photography, with impressive picture quality, comfortable control options that make DSC-RX100 ideal as a step-up from point-and-shoot cameras. 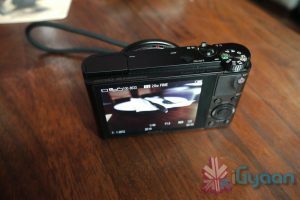 It’s also ideal as a pocket-sized second camera for enthusiasts who want to capture pristine stills and Full HD video while they’re on the move. 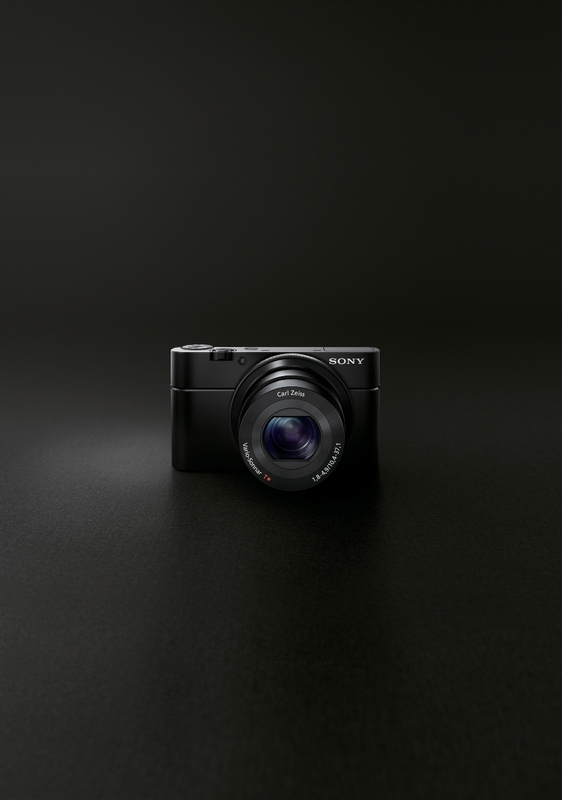 DSC-RX100 is the world’s first1 1.0-type Exmor CMOS sensor with a resolution of 20.2 effective megapixels. 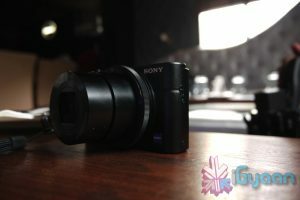 Specially developed by Sony, the sensor has an area that’s around four times larger than the 1/2.3-type imager in regular point-and-shoot cameras. Capturing far more light than small-sensor cameras, it’s the key to beautiful, detail packed images and Full HD movie clips with very low noise. The larger sensor is partnered with an ultra-bright Carl Zeiss Vario-Sonnar T* lens with 3.6x optical zoom range. In contrast with standard point-and-shoot cameras, the wide F1.8 maximum aperture lets in more light to complement the resolving power of the large 1.0-type Exmor CMOS sensor. In common with high-performance DSLR optics, the lens features seven- bladed circular aperture. This makes it easy to produce pro-style defocused effects, with subjects in sharp focus against a smoothly-blurred background. The lens also features an Advanced Aspherical (AA) glass element that contributes to the camera’s extremely compact dimensions without sacrificing optical performance or resolution. Complementing the 1.0-type sensor and lens, the optimised BIONZ image processor maximises shooting responses while assuring exceptionally clean, natural images. Speedy burst shooting at up to 10 frames per second (full-resolution) lets you grab split-second photo opportunities, while high-speed autofocus locks onto your target in as little as 0.13 seconds. Even if you’re shooting outdoors, it’s easy to see subtle details and tones on the bright, high contrast 7.5cm (3″) Xtra Fine LCD. With an extremely high 1229k dot resolution, the screen debuts new WhiteMagic™ technology that uses white pixels in addition to RGB to boost screen brightness. It’s easy to fine-tune your image with a wide range of manual adjustments, whether you’re shooting stills or Full HD video. Experienced photography enthusiasts will appreciate the unique Control Ring that surrounds the lens body. Allowing smooth, fingertip adjustment of exposure, zoom, Picture Effect and other functions, it makes versatile DSLR-style creative control over your image easily accessible. Frequently-used functions can be assigned to a handy Fn (function) button for instant access. Memory Recall stores up to three groups of settings for instant recall – a big time-saver when you don’t want to keep adjusting parameters for favourite scenes. Just like a DSLR camera, there’s a choice of auto and manual focus modes for even greater control over your image. If you’re focusing manually, MF Assist magnifies your image to simplify fine adjustments. There’s also a convenient Peaking function that highlights sharply-focused areas of the image on screen. There’s a generous choice of artistic options to expand shooting possibilities for enthusiasts and novice photographers alike. It’s easy to fine-tune the look of your image with a choice of six Creative Styles to suit the scene or your personal preference. Picture Effect offers an inspiring choice of ‘in camera’ effects that can be previewed on the LCD screen, including Toy Camera, Partial Colour, Pop Colour, HDR Painting, Miniature, Illustration, Watercolour and other (Note: real-time preview not available with all Picture Effect settings). Shared with the latest ? range of A-mount and E-mount cameras, Auto Portrait Framing makes it simple to capture personality-packed photos of family and friends. Cyber-shot™ does all the hard work, automatically detecting faces and cropping the scene to create tighter, pro-style compositions without sacrificing pixel count. 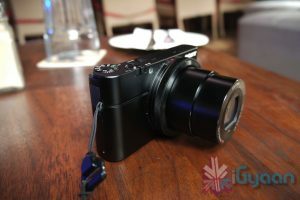 The newly launched DSC-RX100 is priced at Rs. 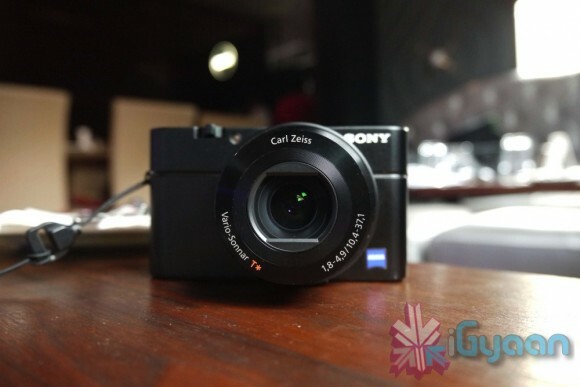 34,990 and is available at selected Sony Center and selected key camera stores across India. Sony India is one of the most recognized consumer electronics brand in the country, with a reputation for new-age technology, digital concepts and excellent after sales service. In India, Sony has its footprint across all major towns and cities in the country through a distribution network comprising of over 10,400 dealers and distributors, 270 exclusive Sony outlets and 23 direct branch locations. Sony India also has a strong service presence across the country with 255 service outlets. Manned by customer friendly and informed sales persons, Sony’s exclusive stores ‘Sony Center’ are fast becoming the most visible face of the company in India. A distinctive feature of Sony’s service is its highly motivated and well-trained staff that provides the kind of attentive and sensitive service that is rare today.